After studying music composition at Oberlin and Columbia, John Kander (b. 1927), at left in photo, settled in New York City, where he worked as an arranger, accompanist, and conductor. 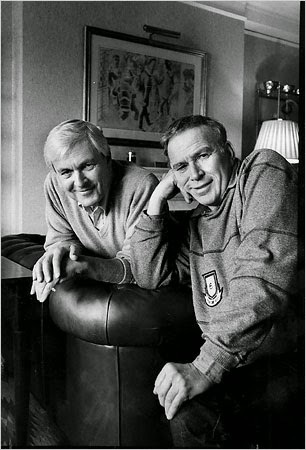 He met lyricist Fred Ebb (1928-2004), at right, in 1963, and they formed a four-decade-long song writing team that produced such stage hits as Cabaret (1966) and Chicago (1975), both of which were made into award-winning films. In 1965 Kander and Ebb joined forces with Harold Prince and George Abbott on a show called Flora, The Red Menace, which made a star out of nineteen-year-old Liza Minnelli, who won a Tony Award for her performance. In fact, Miss Minnelli and Chita Rivera went on to debut much of their material. The rest is Broadway history: The Happy Time/1968, Zorba/1968, 70, Girls, 70/1971, The Act/1977, Woman of the Year/1981, The Rink/1984, And the World Goes 'Round/1991, Kiss of the Spider Woman/1993, Steel Pier/1997 and The Visit/2001. Most of their collaborations were shows that explored the dark side of relationships, and few resulted in a happy ending. Their contribution to the film score of Martin Scorsese's New York, New York/1977 yielded one of their most celebrated songs, sung by Liza Minelli in the film; however, it is Frank Sinatra’s cover that has become the most enduring interpretation. Kander and Ebb – their two surnames were indivisible – it was impossible to say one without the other. Both were openly gay, and it was wrongly assumed by many that they were long-term lovers. In 2003, Kander, who has lived for nearly thirty years with Albert Stephenson (a choreographer and teacher) addressed those rumors in an interview in which he described the nature of his non-professional relations with Ebb as "his 40-year partner in creativity but never in domesticity, much less romance." Marvin Hamlisch said of Kander and Ebb, "All I can remember is that working with Fred Ebb was a lot of fun. You know, John Kander and Fred Ebb wrote as a team. So, most of the songs that were written when we usually worked with Liza (Minnelli) were written by them. However, when it came to doing arrangements and working on Liza with a Z and putting things together, I loved working with Fred Ebb. We had the best time. He and I were really good friends. It was just delightful. He was a very, very smart man. And he was very funny. And he was very caustic. I think he probably wrote for her better than anyone in the world could have written for her. He just understood her so well." After Ebb succumbed to a heart attack* in 2004, Kander continued working on the unfinished collaboration Curtains/2007, a murder mystery musical for which David Hyde Pierce won a Tony Award for best actor in a musical. Rupert Holmes supplied additional lyrics to complete the work. Alas, Curtains was not A-list Kander and Ebb. 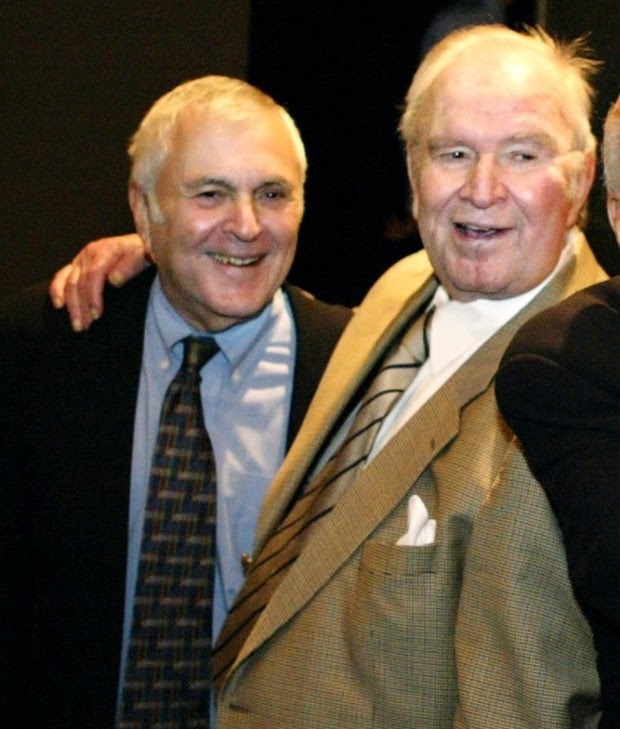 On a happy note, in 2010 John Kander wed his long-time partner, dancer and choreographer Albert Stephenson. Kander, who turns ninety this year, continues to work at his life-long profession. His most recent musical is The Landing/2013, with book and lyrics by Greg Pierce. *Frank Ebb is buried at Green-Wood Cemetery in Brooklyn, New York, also the final resting place of Leonard Bernstein. The 2013 National Medal of Arts (is given) to John Kander for his contributions as a composer. For more than half a century, Mr. Kander has enlivened Broadway, television and film through songs that evoke romanticism and wonder and capture moral dilemmas that persist across generations.